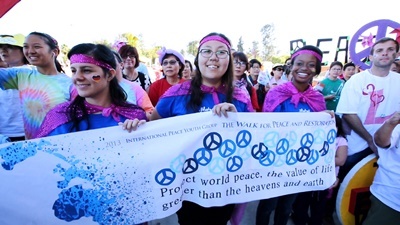 IPYG started out as a group of peace-seeking, determined youth who were active volunteers in the Korean community. After hearing the inspirational speeches of the chairman Man Hee Lee of HWPL, peacemaker and war veteran, Mr Man Hee Lee, these few youth took their passion for peace and put it into starting what now is the International Peace Youth Group. That’s why we are moving for peace. Since May 25th, 2013, in Seoul, Korea, where over 27,000 people took part in our cause, we’ve been marching for peace. Peace walks are one of the greatest ways for our growing movement to create awareness and empower communities around the world to be part of this change. Join us in leading the world in this movement today.